Thanks to Rohde & Schwarz, a leading manufacturer of RF & microwave test equipment, for allowing this reprint of their "Simplifying Signal Analysis in Modern Radar Tests" article that appeared in Microwave Journal's August 2013 edition of Military Microwaves publication. 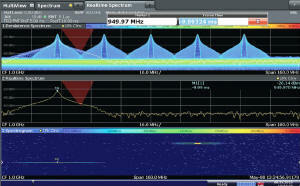 The R&S FSW-K6 Signal and Spectrum Analyzer is used to make measurements and for screen shots. Other great articles that appear in the same edition include: Receiver Protection in S-Band Radars for Mitigation of 4G Signal Interference," "Envelope Tracking in Next Generation Military Radios," and "RF Simulators for Next Gen Phased Array Radar." Fig. 1 Traditional swept-tuned spectrum analyzer architecture. Fig. 2 Typical display of a pulse signal showing pulse width τ and pulse interval T.
Fig. 3 Vector signal analyzer architecture. Fig. 4 The Real-time Spectrum display (top) shows a different spectrum on the lower frequency event, while on the Frequency Sweep display with Max Hold (bottom) it is not as visible. Fig. 5 Triggering on the spectrum enables event isolation and spectrum vs. time viewing in the spectrogram. Fig. 6 The unique pulse signal can be isolated and analyzed completely using the R&S FSW-K6 pulse measurements option. Fig. 7 RGPO test signal including power trend and PRI trend. Fig. 8 VGPO test signal including power trend and frequency trend. Frequency agility – the ability to operate over a wide frequency band to account for atmospheric effects, jamming, interference and detection avoidance. Waveform agility – the ability to operate pulse compression (PC) techniques such as frequency and phase modulation on pulse (FMOP and PMOP) to improve target resolution. Mode agility – the ability to change waveforms and sequences on a pulse-to-pulse basis, including turning PC on and off, changing the pulse repetition interval (PRI) and staggering PRI to avoid range ambiguities. Multifunctionality – the ability to operate as a radar, a communications system (radio) and an electronic warfare (EW) asset. Rapid technology insertion – the ability to change the function and performance of the radar through software. The same DDS technology is also appearing in the EW assets used to deceptively jam these radar systems. In addition to evaluating radar performance in a benign environment, the anticipation of DDS-generated radar countermeasures warrants enhanced receiver testing to assess radar system vulnerabilities. 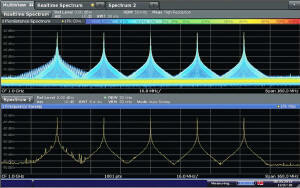 Spectrum analyzers have long been used for analyzing radar signals. To perform even basic pulse measurements, however, users must have a thorough knowledge and understanding of the signal parameters and the operation of the spectrum analyzer in order to obtain valid results. With advancements in DDS technology, the pulse characteristics and pulse sequences produced by radar waveform generators and radar test signals are becoming more complex. For the measurement of these waveforms, conventional swept-tuned spectrum analyzers may not be adequate. 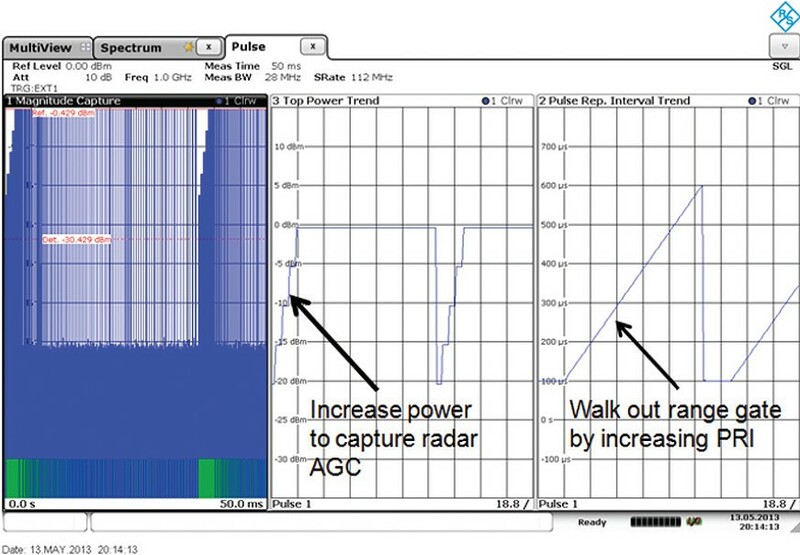 The main advantage of a traditional spectrum analyzer is that it can be used to test frequency-dependent power components over a wide dynamic range. Simple measurements, such as checking the symmetry of the pulse spectrum, are useful in verifying radar transmitter operation. An asymmetrical spectrum, for example, can waste power, generate unwanted spurious emissions and degrade overall radar system performance. When making measurements using a spectrum analyzer, especially on signals with low duty cycles, one must be familiar with the waveform parameters. The proper resolution bandwidth (RBW), span and sweep time must be set to correctly measure the signal under test in order to yield informative results. Figure 1 shows the swept-tuned architecture of a traditional spectrum analyzer. A signal is filtered and downconverted to an IF frequency by applying various resolution bandwidth (RBW) and video bandwidth (VBW) filters to the signal while the local oscillator is swept across a frequency span. Energy versus frequency is plotted on the display. Since a pulsed signal is not on at all times, its energy will not completely 'fill' the spectrum on a single sweep. Figure 2 shows the spectral characteristics of a simple pulsed RF radar waveform with a pulse width τ and the pulse repetition interval T; the amplitudes of the spectral lines are determined by the envelope about the center frequency, f0. 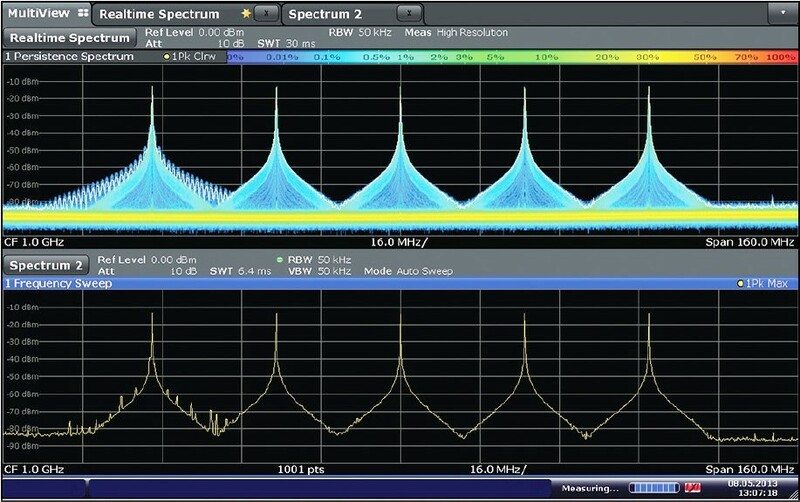 When measuring the frequency spectrum using a spectrum analyzer, it is possible to display the individual spectral lines or the envelope of the pulse spectrum, depending on the instrument settings. To display the spectral lines, the RBW should be set to a value significantly less than the pulse repetition frequency (1/T). The line spacing is equal to the inverse of the pulse period (pulse repetition interval) and is independent of the setting for the sweep time on the analyzer. The amplitude of the spectral lines is also independent of the RBW. While this technique can help characterize a relatively stable, and repetitive pulse signal that does not contain other forms of complex modulation, there are additional challenges for the assessment of DDS-based radar systems that employ more complex and dynamic modes such as frequency agility, variable PRI, pulse compression (modulation inside the pulse), and dynamically variable pulse trains. 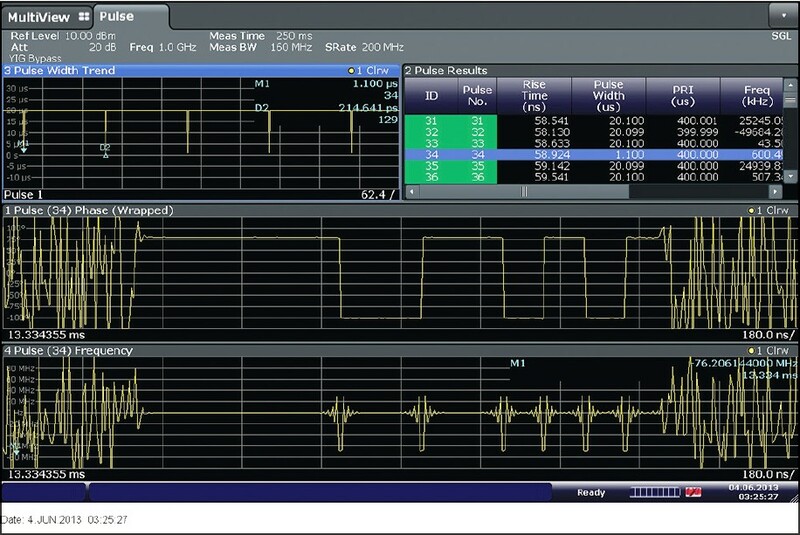 In addition, a swept-tuned analyzer typically provides a zero span function or a video output such that an oscilloscope can capture the time domain signals. The bandwidth of the time-domain signal is constrained, however, by the maximum RBW of the spectrum analyzer. This could be a limitation if the frequency content of the pulse waveform being analyzed exceeds the RBW. Analysis of modern radar signals requires a spectrum analyzer architecture that exceeds the limited capabilities the traditional swept-tuned spectrum analyzer. State-of-the-art spectrum analyzers now incorporate fast Fourier transform (FFT) acquisition and vector signal analysis operating modes. This class of spectrum analyzer is also called a signal analyzer. When signal analyzers incorporate runtime sequential processing of FFTs for functions such as persistency display and triggering, they are also known as real-time spectrum analyzers. 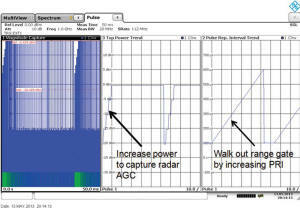 A realtime spectrum analyzer includes a dedicated processing function between the analog-to-digital converter (ADC) and the memory to provide sequential processing of incoming sampled data. One of the benefits of sequential processing and real-time display technology is the ability to see very fast events with 100 percent probability of intercept (POI). A figure of merit for a real-time spectrum analyzer is the minimum event duration for 100 percent POI. As the radar pulse compression technique tends to reduce pulse widths below 4 μs, high-performance real-time technology can improve test confidence. As shown in Figure 3, a vector signal analyzer has a front end similar to that of a traditional swept-tuned spectrum analyzer with filtering and downconversion. Once the signal is downconverted to an intermediate frequency (IF), however, the entire spectrum is digitized by an ADC and placed into memory. 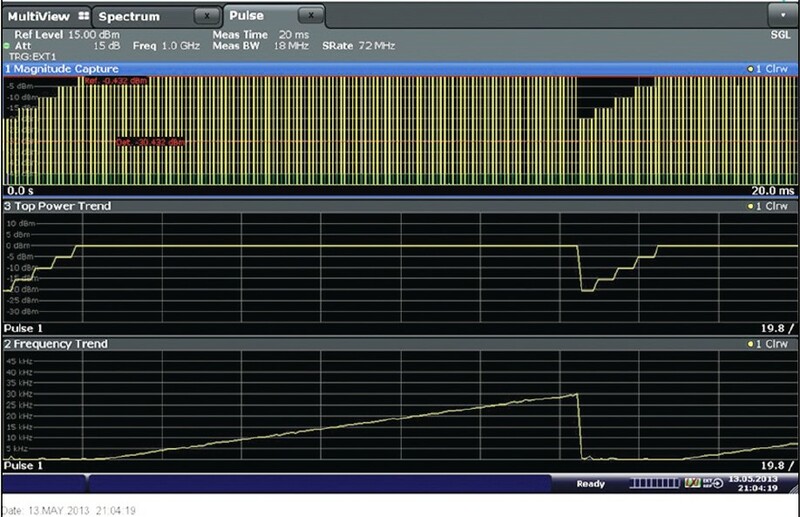 The time-sampled data can then be converted through FFT and waveform processing, where the spectrum, time and phase information is extracted and stored for analysis. Unlike the swept-tuned analyzer, the bandwidth of a vector signal analyzer is not limited by resolution bandwidth, but by its IF bandwidth defined by the ADC, the sampling rate and associated IF filtering. 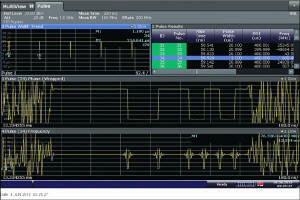 Typical vector signal analyzers have bandwidths ranging from tens to hundreds of MHz. Acquisitions are seamlessly captured into memory, and subsequent FFT processing and analysis can be performed on the acquired signals. The wider IF bandwidth enables analysis of much faster rise/fall times (and narrower pulse widths), wider bandwidth signals (e.g. chirps), and the analysis of frequency-agile radar waveforms across a much wider band. Figure 4 shows the spectrum of a frequency hopping sequence over a 160 MHz span. There are two displays shown for comparison. The lower display (Frequency Sweep) is what is measured using a traditional swept-tuned spectrum analyzer, with the trace set at Max Hold while the parameters of the sweep are set to 50 kHz RBW and 6.4 ms sweep time. The five hopping frequencies are displayed and there appears to be some level of spurious emission across the band of interest. The upper display (Persistence Spectrum) in Figure 4 is what can be seen using the features of a vector signal analyzer. It shows a color gradient scale based on the accumulated occurrence of the pulse signals. Since the real-time display is based on vector analysis techniques, the entire sequence of the pulse events is captured instantaneously. Observing the difference between the two acquisition techniques, there appears to be a distinctly different spectral shape appearing infrequently in this operating mode on the lowest of the fi ve hopping frequencies. 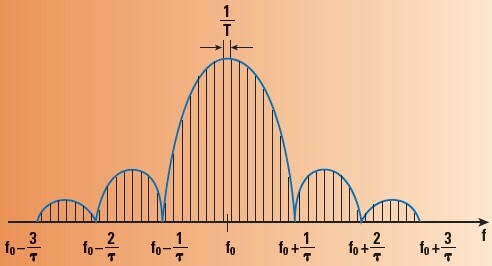 Because the spectrum of this event is different from that of the other pulses, a frequency mask trigger (FMT) function can be used to isolate the signal (see Figure 5). Once isolated, a spectrogram display shows that this event appears to be faster than the other frequency hops. Shown in the bottom of the spectrogram display in Figure 5 the adjacent event also appears to be ON for a longer period of time than the triggered spectrum event. Because they collect the entire IF band of interest seamlessly into memory, state-of-the-art vector signal analyzers can now provide pulse measurement options to completely analyze the pulses and pulse trend sequences of modern DDS radar signals. For example, the R&S FSW signal and spectrum analyzer with the R&S FSW-K6 pulse measurements software option can be used to analyze over 100,000 pulses with time-correlated views of the spectrum, timing, modulation and statistical properties of the signal. 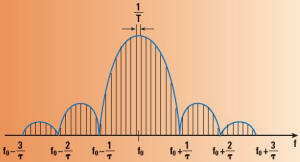 These are useful functions not readily available on traditional swept-tuned spectrum analyzers. Furthermore, based on the performance of the analyzer and independent time synchronization, important pulse-to-pulse parameters can be measured. The accuracy of the analysis depends on several of the signal and performance features of the spectrum analyzer: the signal-to-noise ratio of the signal, the signal bandwidth and measurement filters applied, the reference clock jitter, and the phase noise accumulated during the measurement pulse period. An example of automatic pulse measurement analysis is shown in Figure 6. For this analysis, the pulse width trend, the results table and the pulse information are displayed for several hundred pulses captured over a 250 ms period. The ratio of the signal is 128:1, meaning there are 128 events with a 20 μs pulse width to a single event with a 1.0 μs pulse width as shown in the upper right pulse width trend display. The selected pulse from the results table (the upper right display in Figure 6), selects the pulse waveform of interest to be displayed for the two trace display windows at the bottom of the figure (Pulse Phase and Pulse Frequency). It can now be seen that the demodulated pulse waveform has changed from a pulsed continuous wave signal to a polyphase pulse compressed Barker 13 waveform for the 1 μs pulse period. This dramatically changes the radar’s resolution on a repetitive basis, but only for a very short period of time. By utilizing a combination of real-time technology to isolate the signal of interest and pulse measurement analysis of a single pulse, a complex pulse signal is easily characterized. Traditionally, radars that needed EP required a substantial amount of testing to evaluate their effectiveness against likely deceptive jamming techniques. As new threats evolve, the test profiles for DDS radars must also evolve. It is also important to validate the test signals used to evaluate radar receiver vulnerabilities. Range gate pull-off (RGPO) is a classic deceptive jamming technique where a jammer tries to confuse the radar’s range tracking system. As shown in Figure 7, during RGPO the power of a jammer will increase in an attempt to capture the automatic gain control (AGC) of the target radar. Once captured, the jammer will then attempt to push or pull the range gate in time by varying the PRI, forcing the radar to break track with the target. Pulse compression techniques can be used to reduce the effectiveness of RGPO, since the radar can sense the type of signal being processed in the receiver as a foreign (bogus) return and respond either by ignoring the jammer temporarily or by switching modes and/or frequencies. One of the more advanced DDS jammer techniques, and potentially much more troublesome for the radar, is digital RF memory (DRFM). 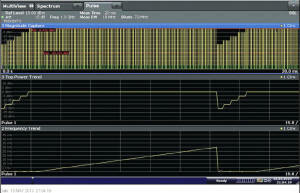 DRFM directly captures, modifies and retransmits a response that is much more difficult to detect as a foreign return. DRFM typically modifies the delay or Doppler of the return to attempt to deceive the velocity gate of the target radar system. Figure 8 shows an example of the velocity gate pull-off (VGPO) deceptive jamming technique, which is similar to the range gate technique. VGPO employs a similar increase in power to capture the radar AGC, and then gradually shifts the frequency of the return such that the velocity tracker system breaks with the target. As DDS-based radars encounter new EW capabilities and tactics, radar receiver testing will continue to evolve in order to keep pace. Many of these threats are based on a thorough understanding of the radar signals in order to provide realistic target speeds (Doppler walk), for example, to deceive the radar processor. Having the tools to perform trending and timing analysis of various parameters can provide confidence in the test process. Modern radars have evolved and capitalized on the improvements in DSP processing and wideband digital converters. This evolution has dramatically improved the functionality and utility of DDS radars. At the same time, the test methods and tools have had to evolve in order to keep up with the requirements for testing these radars. State-of-the-art spectrum analyzers based on vector signal analysis architectures can provide the building blocks for simplifying the testing of DDS radars. By combining real-time functions and automatic pulse software, the sophisticated new spectrum analyzers are up to the task of simplifying testing and analysis. Reprinted with permission of MICROWAVE JOURNAL® and Rohde & Schwarz from the August 2013 Military Microwaves Supplement. ©2013 Horizon House Publications, Inc.